the raptors want to trade t.j. ford. they’re ready to go with jose calderon as their point guard. supposedly they were going to trade ford and rasho nesterovic for jermaine o’neal. which i think would have been a mistake. but mostly because i don’t like the pacers and i do like t.j. ford. so if they’re interested in keeping me happy, indiana and toronto made the right move in stopping the negotiations. i’m not a knicks fan or anything, and i’m certainly not a mike d’antoni fan, but i think the knicks should try to get t.j. ford. he could just run all over the place. or i think the hawks should. but they just got mike bibby. or maybe the trailblazers. as guess as long as he doesn’t land on his neck again i’ll be glad that he’s still playing. even if he’s playing on a team i don’t like. deron williams and carlos boozer are on the usa olympic team. i still think iverson should be on the team, but i’m glad they went with williams. i think boozer might be an olympic dud, but maybe i’ll be wrong. even if boozer is on the jazz, he still went to duke, so there’s plenty about him to not like so much. especially since he never responded to brian’s suggestion that he take on the nickname slambidunkxtrous. rafael nadal played his opening match of wimbledon this morning against andreas beck. i kept thinking he was playing against john beck, but i think he wouldn’t have dropped a point against john beck. or against jon schmidt. if one of the sets was a piano competition, i still think nadal might win. i don’t know if nadal has ever played the piano, but i’m sure i’d like him as a piano player. i’m biased though. i think i would root for nadal in anything. and i know that i would root against jon schmidt in everything. like if he was up against cancer (even just skin cancer) or something, i’d root for cancer. so nadal won 6-4, 6-4, 7-6. he didn’t face a break point all day, and was (clearly) totally dominant on his serve. but his return game left a lot to be desired. he was on the defense during beck’s service throughout the morning. only 2 breaks. anyways, they went to tiebreak in the 3rd set and nadal beat beck 7-0. it’s just the first round, and it’s not nadal’s favorite surface, so i think he’ll get more return confidence. his next round matchup is against a big server, so hopefully he figures that out quick. the williams sisters won. they both looked really good. venus was playing really well, i thought. 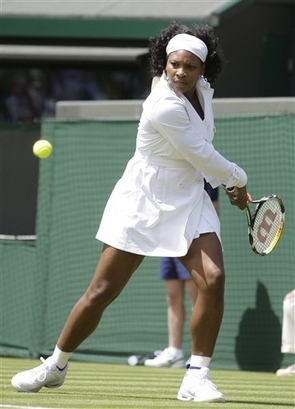 and serena played in a trenchcoat. well, she warmed up for like 2 minutes in a trenchcoat and then took it off. i think that a williams sisters final would be awesome. i would root for venus. they’re doing a piece on lindsay davenport. how she lost to venus in the 2005 final 4-6,7-6,9-7. then some really touching music came on. you know, kind of like the where amazing happens music, but more touching. and it showed davenport’s baby and she said that tennis isn’t her top priority anymore. i wonder if her baby will be a tennis player. or a piano player. i wonder if lindsay davenport has ever met jon schmidt. somehow that guy is “semi-popular” outside of utah as well. that’s something i just don’t get. they just said her husband’s name is jonathan. makes you wonder. 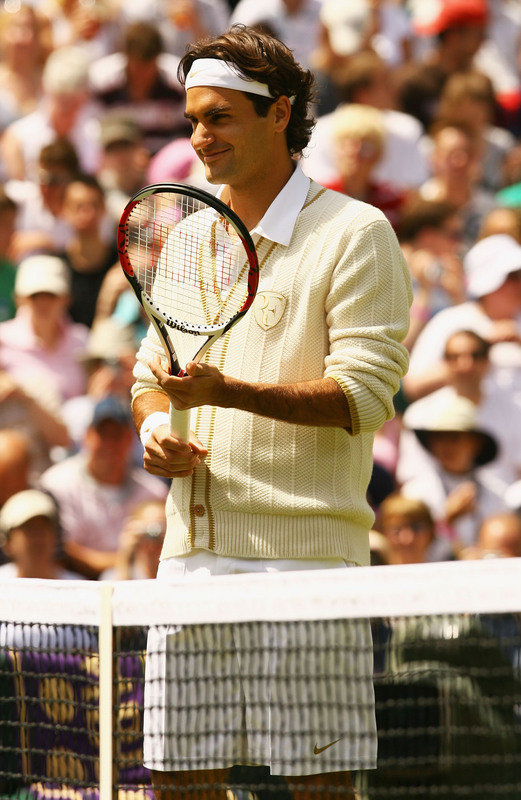 so federer showed up to wimbledon with a cardigan that has and “F” on the chest. and it has 5 buttons. one for every wimbledon championship. i don’t remember how many buttons his jacket had at the french open. but i do remember how many french open championships he has. dis. anyways, i like federer. i don’t get why everyone thinks that he’s struggling so much. so he lost to djokavic in the australian open and to nadal in the french open. big deal. djokavic is playing really well and nadal is the best clay-court player ever. so coming into wimbledon everyone was talking about how this is the year because federer is on the way down. but he hasn’t lost a grass court match since like 2004 or something. i think 60 straight grass court matches. not only is federer probably the best tennis player in history, he’s for sure the best grass court player in history. so i don’t know what people are talking about. i mean, i think nadal is going to make him work for it. if they face off in the final, i’m hoping for another match like last year’s. but still, it’s federer. and he’s the one to beat. but even if you’re roger federer, you don’t have to buy into how you’re supposed to wear something classy to wimbledon. wimbledon dress-code is worse than the nba dress-code which is racist. wimbledon tries to make you remember that you’re not supposed to play tennis unless you’re rich. i guess you don’t play wimbledon unless you’re rich. or rather, as soon as you win wimbledon you’re rich. and then you can buy cardigans to wear. so despite everyone worrying about roger’s focus and his abilities, he cruised to victory in the first round. i don’t want to look up the score. he won in an hour and 19 minutes. oh yeah, and sharapova won. her dog gave her the signal to eat a banana partway through the second set. i have been turning on wimbledon a lot lately because i think its the movie with kirsten dunst. Calderon is so much cooler than TJ Ford. So is Mike Bibby.